Perfect for breakfast, brunch or even lunch this omelette recipe is quick and delicious. Substitute mushrooms for your favourite vegetables like peppers or onions. In a bowl whisk together the eggs, cream and seasoning. Slice the sausages into 2 cm pieces. Drizzle the oil on an ovenproof pan over a medium heat and add the mushrooms andsausages. Cook for 1 – 2 minutes. 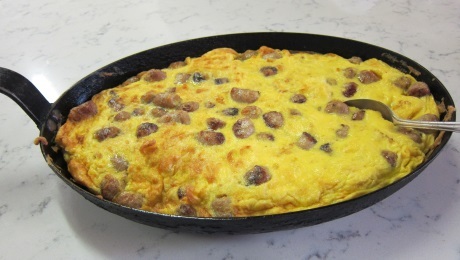 Pour the egg mixture over the sausage and mushrooms and cook for 5 minutes over a medium heat. Transfer to a preheated oven and cook for 10 -12 minutes, then remove from the oven and allow rest for a minute or two. Serve immediately.